“Soorya Re-Energy Pvt. Ltd.” is a Solar company being a renowned name in India with its Head Office based in coimbatore, Tamil Nadu and having its branch offices in Trichy, Chitradurga, Delhi, Mumbai, Kolkatta and servicing clients nationwide. “Soorya Re-Energy” is an employee owned & driven company with high value systems and customer satisfaction. We create our products for a number of sectors including Agriculture, Industrial, Domestic, On Grid and Off Grid. Since our humble beginning we have worked hard to get to where we are today and have embraced every opportunity that has come our way. Luckily, a combination of passion, grit and determination signifies that our business has not only grown, it is put as on path to success. We’re proud to say that our achievement is directed as to the best of what we do. We at “Soorya Re-Energy” acclaim to give the best of the best to our customers. Through our commitment to quality, constant innovation and respect for the planet, we aim to exceed expectations and be rewarded with a smile. We are ready to meet challenging goals by engaging the best talent and passion of people who believe there is always a better way in the growth of our customers. “Soorya Re-Energy” products are trusted and loved everywhere in the country for its quality. That is a result of the combined strength of our development, production, sales and servicing operations which are based on “CUSTOMER FIRST” principle. Our Vision “Moving from a single product company to global opportunities in SOLAR par excellence”. Solar energy is now in competition with other forms of energy production, making it a smart time to invest in solar. 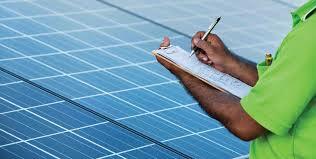 Additionally the Central / State Government also provide subsidy which makes solar a good financial decision. We are A ONE STOP SOLAR ENERGY PROVIDER using the state of art technology. It has always been proven that we are far ahead than our competitors. This technology is neither dependent on electricity nor on diesel, thus people at remote locations can also avail the benefit of “Soorya Re-Energy”, and enhance their cropping area with regular water supply through solar pump. It is a sacrosanct from electricity which hampers productivity of an individual due to load shedding and interrupted electric supply. Solar pumps are free from problems like feeder damage, supply cut, rate hikes, etc. It has been observed that due to frequent voltage fluctuations most of the motors get burnt and maximum time they are lying at service centers. But “Soorya Re-Energy” generates constant and good quality of energy which enhances life of pumps. “Soorya Re-Energy” is an efficient, low maintenance and economical option for farming and agricultural applications. Seeing India’s push for renewable energy to reduce our dependence on fossil fuels we have further expanded our services into solar commercial roofing and solar water heating systems.